Online registration is now closed. You may register in person on the lawn of the Masonic Lodge, 1004 SW 152nd St., Burien, WA 98166 on September 29 from 12:30 p.m. -4:00 p.m. or on September 30 from 11:00 a.m. - 12:45pm. 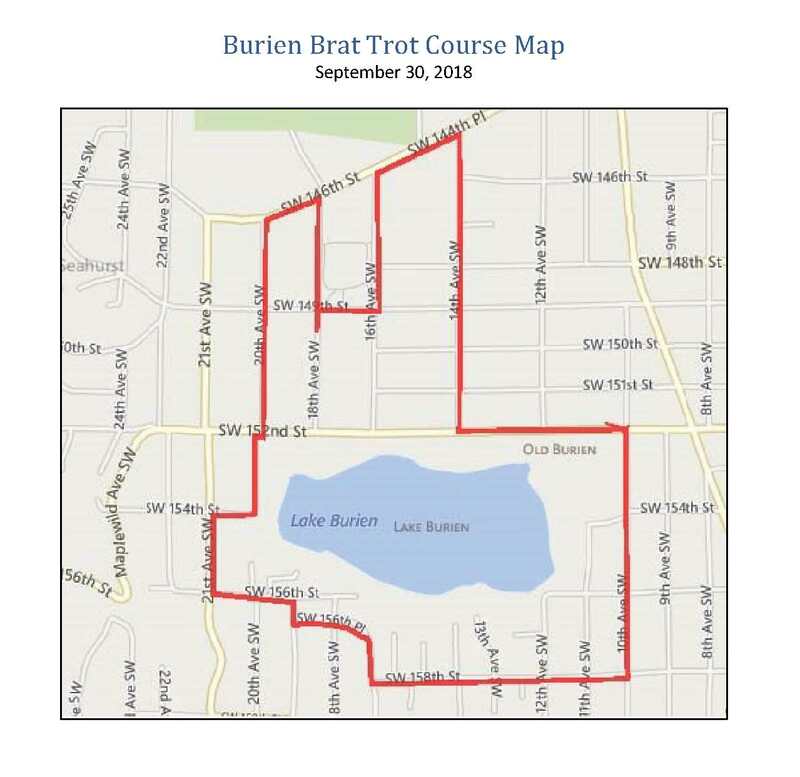 The Burien Brat Trot is a flat and fast 5K and one mile race through the streets of Burien followed by the best street party around...Bavarian Fest...complete with beer gardens, live bands, sausage, bouncy toys, food, and more. The run is family-friendly, stroller friendly, and a great time for all. Proceeds from this run support Highline Schools Foundation, supporting students and teachers of Highline Public Schools. WARNING: READ CAREFULLY. THIS AGREEMENT INCLUDES A RELEASE OF LIABILITY AND WAIVER OF LEGAL RIGHTS AND DEPRIVES YOU OF THE RIGHT TO SUE THE BURIEN BRAT TROT AND OTHER ASSOCIATED PARTIES. DO NOT SIGN THIS AGREEMENT UNLESS YOU HAVE READ IT IN ITS ENTIRETY. SEEK THE ADVICE OF LEGAL COUNSEL IF YOU ARE UNSURE OF ITS EFFECT. I understand that my consent to these provisions is given in consideration of the acceptance of this registration and for being permitted to participate in this event. I am a voluntary participant in this event, and in good physical condition. I have been advised that I should seek advice from my physician before undertaking this physical exercise. I have either visited with my physician and received doctor's advice and consent to my exercise program or have waived such advice and consent of my doctor, and except any and all risks. I KNOW THAT THIS EVENT IS A POTENTIALLY HAZARDOUS ACTIVITY AND I HEREBY ASSUME FULL AND COMPLETE RESPONSIBILITY FOR ANY INJURY OR ACCIDENT WHICH MAY OCCUR DURING MY PARTICIPATION IN THIS EVENT OR WHILE ON THE PREMISES OF THIS EVENT, AND I HEREBY RELEASE AND HOLD HARMLESS AND PROMISE NOT TO FILE SUIT AGAINST HIGHLINE SCHOOLS FOUNDATION, HIGHLINE PUBLIC SCHOOLS, THE CITY OF BURIEN, SOUTHGATE MASONIC LODGE, THE TIN ROOM BAR LLC, AND ANY AFFILIATED INDIVIDUALS OR ENTITIES ASSOCIATED WITH THIS EVENT INCLUDING ALL SPONSORS (THE RELEASEES) FROM ANY LOSS, LIABILITY OR CLAIMS I MAY HAVE ARISING OUT OF MY PARTICIPATION IN THIS EVENT, INCLUDING PERSONAL INJURY OR DAMAGE SUFFERED BY ME OR OTHERS, WHETHER SAME BE CAUSED BY FALLS, CONTACT WITH PARTICIPANTS, CONDITIONS OF THE COURSE, NEGLIGENCE OF THE RELEASEES OR OTHERWISE. I understand that this Waiver and Release may be stored electronically and agree that a copy is authentic and admissible as evidence in any future dispute or proceedings. If I do not follow all the rules of this event, I understand that I may be removed from the competition. I give my full permission to THE BURIEN BRAT TROT organizers, their sponsors and corporate sponsors to use any photographs, videotapes or other recordings of me that are made during the course of this event. I have read, understood, and accept the agreement above. My submission of this form shall act as my legal signature. Note: Registrant must be over 18 years of age; or signed by parent/legal guardian of minor, incapacitated, or mentally challenged person.